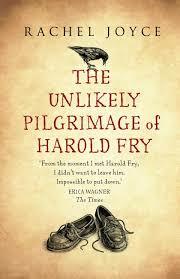 And I'm now reading The Unlikely Pilgramage of Harold Fry, a novel by Rachel Joyce about a timid retired man who receives an unexpected letter and sets off on an impulsive 600-mile walk from Devon to Berwick-on-Tweed to save the life of the dying person who sent the letter. [Incidentally, Werner Herzog once did the same in 1974 when he learned that his friend and mentor Lotte Eisner was seriously ill in Paris, so in an act of faith, he walked all the way from Munich to see/save her]. Joyce's book (interesting that it's written by a woman) is full of regret and loneliness but also hope and the desire to do something out-of-character and astonishing (though the character of Fry plays the latter down; he's British after all). At times I found it a little twee but mostly it was uplifting. I gather it was originally a play on Radio 4 and could end up being a film?